A trilingual graduate is celebrating this week after securing a dream job in Italy. Stephanie James, who studied French, Italian and Spanish at Bangor, turned down an internship with Versace in Milan in order to accept a post as an English teaching assistant at the Sant'Alessandro school in Bergamo, Italy. She will start the job in September. Stephanie, from Norfolk, is the first ever European citizen to be offered the assistantship, organised through SITE, which is an organization that links high-profile schools in the Lombardia region with a specific group of universities in America. 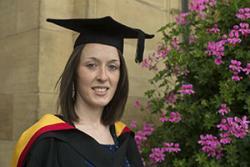 The School of Modern Languages graduate said, “It feels amazing to be graduating. Four years of hard work has been worth it!! “I always loved languages at school and knew that I wanted to pursue a career within that area. Studying for a triple language degree was the best decision I have ever made and I don't regret it for a second, even though it was very challenging. The fact that I have a job in Italy (my favourite country and language) as an English teacher in a private school has made everything worth it and I couldn't be happier. “I chose Bangor because it is the only university in the UK that allows students to follow a three-language degree focusing solely on the language and not on cultural modules. Furthermore, it is the only university that allows students to benefit from a semester abroad in each of the three countries. During her degree, Stephanie spent a year and a half away from Bangor, spending one semester in the French speaking part of Belgium, one semester in Spain and one semester in Italy. She said: “I had an amazing time and I think that time spent abroad is the best way to really develop language skills. Following her post this year as an English teacher in Italy, Stephanie plans to do a Master’s degree in translation and interpretation (Italian-English).